“They did it,” posted excited resident PADI Course Director Richard Swann on Facebook last night when he learned the results of the PADI Instructor Exam in Sabah, Malaysia. 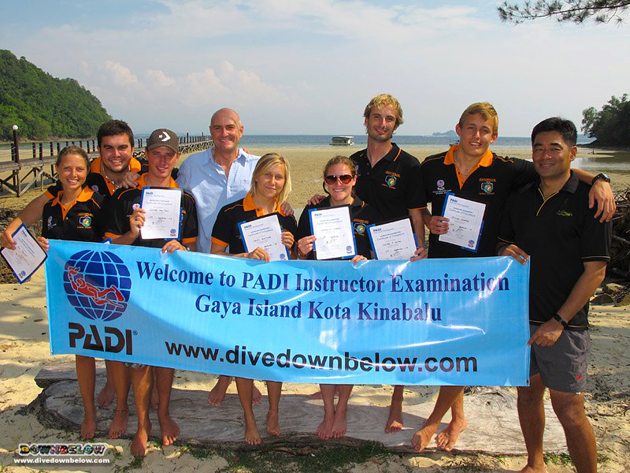 Indeed, all 7 Downbelow’s candidates who joined our September Instructor Development Course here in Sabah, aced their final exams are now all qualified PADI Open Water Scuba Instructors. The international group of candidates were all part of our professional internship in Malaysia, which means they now enter the professional scuba diving job market with the benefit of experience to showcase on their resumes. We dive every day from our busy Gaya island-based dive centre, were our interns have plenty of opportunity to assist with a diverse clientele taking part in the spectrum of PADI courses. Downbelow specialises in groups, and because of our strict safety standards, interns further get the opportunity to experience the implementation of stringent dive safety plans and workflows; experience you can’t obtain from simulated environments. With our latest brood flying the coup, we now look forward to our next PADI IDC in November. The IDC runs from 8 – 19 November, followed by the Instructor Exam on 20 & 21 November. Email or contact us today to join the IDC and gain the benefit of our professional internships.